A farm business plan or a farming business plan will help establish guidelines to grow a profitable farming business. There are different scenarios that would entail a farm business plan or a business plan for farming activities. This could include the lease of acreage to produce a certain crop or the purchase of a hobby farm. A business plan can be developed for raising chickens or an apple tree farm. 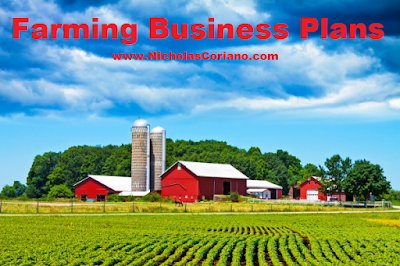 A business plan focused on agricultural or farming activities is different than your average business plan. For example, when farming certain crops, the yield or return of the product does not come about for years. This means that there will be an upfront investment that is not returned until the crop is ready to harvest. Similar, some farming activities can only take place during certain seasons. The seasonality of the farming activity means revenues only come about certain times a year. This should be accounted for in the business plan. Farmers and farming companies should be on a fast track to sell their goods and products before they are made. Yes before they are made or produced. Large farming companies pre sell their crops via option contracts on public exchanges like the Chicago Board of Exchange (CBOE). This allows them to have the revenue upfront to invest in the farming process. For example a large grocer can purchase an option contract for oranges and the farmer will use the money gained from the option contract to farm the oranges. Once the oranges come to fruition, the grocer has the option to buy them at the preset option contract price. I can write business plans for many different types of businesses in addition to farming. In specific to farming, standard business plans can include; apple tree farming business plan, vegetable farming business plans, livestock farming business plan, forestry business plans, organic farming business plan, seed farming business plan, flower farming business plan and all other farming operations. Each business plan is tailored specifically for each client. No templates. Contact me today.